This fantastic production for all the family at The Theatre, Chipping Norton travels across continents and time zones at breakneck pace. It’s set in 1872, the Victorian age of adventure and invention. Jean Passepartout and his master, Phileas Fogg, attempt to be the first to circumnavigate the globe in 80 days in a make-or-break wager with members of the Reform Club in London. They are closely followed on their journey by Fix of the Yard, a copper from Scotland Yard who suspects Fogg of theft and the murder of a Bank of England night guard. Just as the Victorians were great inventors, so this show is ingenious in its presentation. The actors portraying the principle protagonists also become an array of other characters, often with wonderfully inventive use of props and accents, and great comic effect. It’s a very physical production with some great set pieces, and all three actors are hugely entertaining. 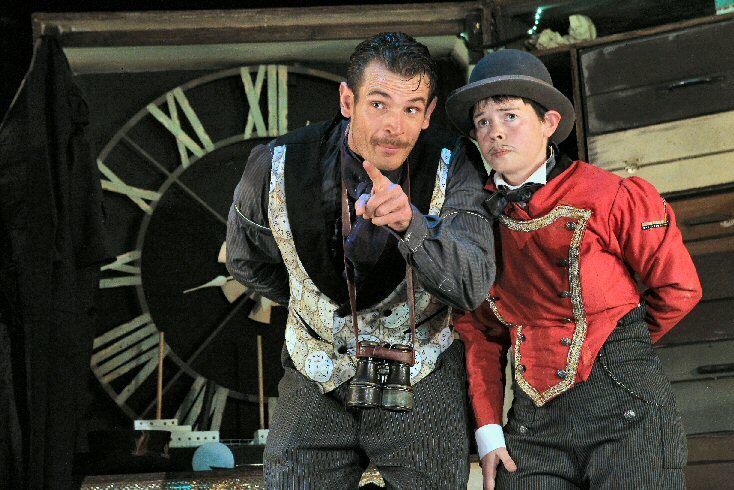 Around the World in 80 Days is on at The Theatre, Chipping Norton, until Sunday 28 September. If you miss it there, try to catch it on tour elsewhere throughout October and November. This entry was posted in review and tagged Around the World in 80 Days, Chipping Norton, review, The Theatre, theatre. Bookmark the permalink.